So we all know the deal with what is going on in Libya with their dictatorship run by Muammar Gadaffi being revolted agains by the Libyan people. Libya has no free press, so details are sketchy unless released by their government, but it is reported that upwards of 400 have been killed by his regime, as he commanded his armed forces kill any protesters. 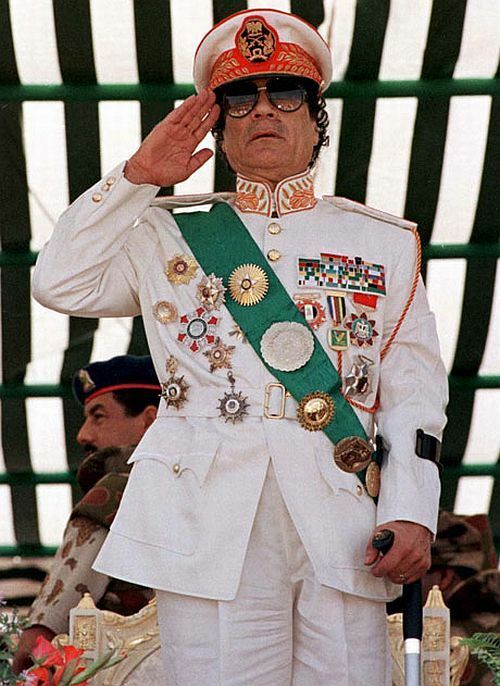 Muammar Gadaffi, as bad of a man as he is....Knows how to suit up!! It seems that this guy, aside from killing hundreds of protesters, has a killer fashion sense. Check what i mean in the pics below. First bit sounds like Dr Le Cornu. As for his fashion sense, you are joking right? Hes either wearing a dress or military uniform, he has the same fashion sense of Clinger from MASH. What im trying to say is he comes off like he thinks he's a fashion model, lol.